UDM Downloads > Oxygen Phone Manager II for Symbian OS phones! Oxygen Phone Manager II for Symbian OS smartphones lets your PC and mobile Symbian OS phone communicate with each other. The program allows you to work with Phonebook, Calendar, To-Do List, Profiles, Log records, Applications, Images, Melodies and Messages. 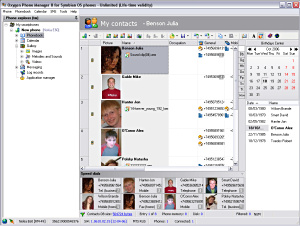 You can load your phonebook from the phone, edit contacts, set individual contact pictures and ringtone, define Full Name format for each contact, import and export the phonebook's data, and browse detailed information about your contacts using vCard window. In the Calendar section, you can work with events of various types: Meeting, Reminder, Anniversary, etc. Recurrent events, such as Birthdays, can be easily organized as well. The Images browser allows you to manage the images stored in your phone including. You can download the images from your phone, delete them and add new ones, save images to several file formats and copy them to the clipboard. The Melodies and Sounds section allows you to view and listen to the melodies and dictaphone records in your phone, add new melodies or delete unwanted ones. The Messages section handles all messages in your phone. This section allows you to read Inbox, Outbox, Drafts, Sent, My folders, Mailbox folders content, display basic message types - SMS, MMS, E-mail, Beamed (received via BT or IrDA), BIO (Picture message, Operator Logo, Ringing tone), read and display file attaches for MMS, E-mail and Beamed messages. It allows you to create and delete custom message folders, delete messages from your phone and move them between folders. You also will be able to create and send both plain and Unicode SMS messages to individual recipients as well as to contact groups. Handling To-Do Lists, Profiles and Log records is simple and easy as always. Application Manager allows you to manage applications and games: get complete list, run and install new applications. Section supports both Symbian and Java applications.